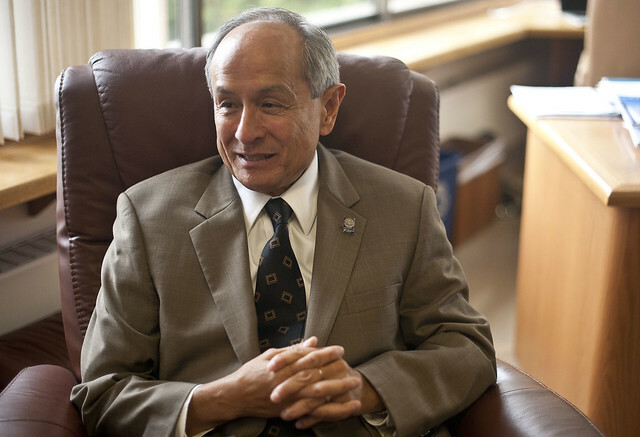 Following a 24-year term served by Robert A. Corrigan, University President Leslie E. Wong, who was the former president of Northern Michigan University, has recently begun his first year at SF State. Photo by Sam Battles. Among the new faces on campus this semester will be that of Dr. Leslie E. Wong, SF State’s new president. Wong hails from Northern Michigan University, a University much smaller than SF State, where he focused on forging connections with both students and faculty. Golden Gate Xpress Editor-in-chief Kale Williams had the pleasure of sitting down with the incoming University president to discuss adapting to city life, executive compensation and Wong’s vision for the future of SF State in these troubled economic times. SF State spokeswoman Ellen Griffin also sat in on the meeting. Northern California is pretty different from Northern Michigan. How has the transition to San Francisco gone so far and what are your favorite and least favorite parts of city life so far? Leslie E. Wong: Good question. It’s been a little easier because it’s coming home for me, even though I was raised on the Oakland side in the East Bay. Certainly getting used to parking, parking, parking, no matter where you go on campus, downtown. But we’ll get used to public transit, etc. The hardest part for me is that I’m a bicyclist and I haven’t used my bike yet because I want to get a mental map figured out, but I was very much into walking and using my bike in Michigan. You only had to worry about hitting deer, moose, porcupines, so getting back to the city has been fun, but it is really different. Luckily my driving skills haven’t gone away, so that’s been an easy adjustment. I am thoroughly excited by the diversity on campus. It’s wonderful to go into Cesar Chavez Center and hear Spanish, Chinese, Mandarin, Cantonese, to hear other languages. It’s a good reminder that an education is for the world. It’s not just for you or for your family, although that is important, but it’s about understanding the world and being a part of it. I’ve really enjoyed that part of it. So what neighborhood did you choose to live in and are you renting or did you buy a house? LW: We’re renting right now. We wanted to be in the city, so we’re living near campus, which makes walking and biking much easier. That is, if you’ve had a typical day so far. I know the semester hasn’t started yet. LW: I readily admit that I am not a morning person, so I usually try to get in to campus somewhere between 8 and 8:30 and the meetings start pretty soon thereafter. One of my habits is, I really plan for an hour in the middle of the day just to think through things. Issues that address the student experience and faculty. Sometimes it’s good to get away from the phones and technology and all of that stuff and just say, “Am I thinking straight about certain things?” And then the meetings start again. I’m trying to get around to meet department heads, unit heads. There are certain departments that have wonderful reputations, which is almost every department on campus, and just trying to get close to meeting those folks that do such a great job. President Corrigan left behind a legacy of campus expansion here at SF State. What do you hope to leave as your legacy? What would you say is at the top of your priority list as you get started here in your first year at SF State? LW: There is an end to this, a motive — in March we’ll be meeting with our accreditation people, and we’ll be talking about the future and how that finds some reality in the strategic plan. And so, between now and March, I want to talk with everyone about their aspirations. When I met with the provost council, that was my first comment to them that not only do we have to be ready for the accreditation, you have to make sure that I understand the future that you guys see. It has to resonate between all of us. I’ve asked the enrollment management people. I’d like to know who our aspirational peers are because, with accreditation, they typically benchmark you against your traditional peers. For me that’s not good enough. I want to know who we think represents best practices, the best kinds of things, and let’s benchmark ourselves against that group. That’s going to be a pretty involved discussion. Students should also be thinking about, “How can we can contribute to campus life now?” so that the freshman who shows up in 2018 goes, “It got started back in ’12. I’m experiencing a super campus because of the interactions between the students and the president back when he started.” So I’ve had to get that straight. It’s less about me defining the vision, and it really is about me making sure I am a catalyst for a new vision for San Francisco State.